The Case For Christ is definitely a film where the premise strikes out at you immediately. In 2 of the previous Christian films that I’ve seen (God’s Not Dead 1 and 2) it was about the main character having to prove that God was real. This title flips that around by having the lead try to prove the opposite, that God is fiction. He seeks to do this by overturning the biggest event in Christian history, the death and resurrection of Jesus Christ. Is this feasible or will Lee soon find out that debunking such an event is as futile as trying to suggest that the world is actually flat? The film starts off with Lee and Leslie heading to a diner to enjoy a nice meal. Unfortunately the situation grows dire when their daughter begins to choke. As despair begins to set in and all hope is lost, a nurse steps in and is able to save their daughter in the nick of time. She is a Christian and Leslie begins to believe that maybe there is a God who is watching over everyone. She goes with the nurse to Church and gets saved. Lee is not happy with this as he is a devout Atheist and tells Leslie that there is no way they can stay together unless she renounces her faith. Leslie refuses and so Lee decides that he will put his reporting profession to use by finding evidence and making a complete case that God doesn’t exist. Naturally such a journey is doomed for failure. It’s interesting to see the evidence behind the existence of Jesus Christ and how we have hundreds of accounts from individuals who saw him. The mountains of evidence left behind is quite impressive. To Lee’s credit, it does make sense to attack the resurrection if you were trying to debunk the religion since that miracle is really what proved beyond a shadow of a doubt God’s power. There are many other moments in the Bible of miracles as well and even if there wasn’t a mountain of evidence to defend the Resurrection that wouldn’t be enough to rock our faith. At the end of the day it is impossible to 100% prove or disprove many things. You often have to take a leap of faith and it wouldn’t be worth much if you didn’t need it to proceed. I’m not saying that I would refuse additional proof if it was ever discovered, but I’m fine without it. Everything within the Bible is ultimately all that we need to know. The film fortunately has a happy ending for Lee’s character as he concedes defeat. He was not able to prove that God didn’t exist and furthermore, he only just ended up convincing himself of the opposite. It was a good way to close his character arc. That being said, I wasn’t a fan of the character. He definitely did not take the situation in stride and came across as completely unreasonable. He’s been married to Leslie for several years at this point, enough to have a daughter who is old enough to talk and everything. Yet, he almost immediately wants to end the marriage because she has become a Christian. I can understand not wanting to accept this and to continue debating it, but not wanting to leave immediately. It’s not like the person suddenly became a Satanist or anything like that. He also doesn’t have any sympathy for criminals and even puts an innocent man in jail because he couldn’t be bothered to look at the facts of the case more closely. That same guy then gets stabbed and nearly fatally injured. Lee is sad about that, but the guy just created so many problems during the film. Leslie was a good character. She wasn’t too forceful about turning Lee into a Christian right away which was good. It makes sense that she would understand the situation and try to be tactful about the whole thing. Naturally she wouldn’t give up on converting him and that’s good because as a Christian you understand the stakes better than anyone. If she can’t convert Lee in time, he’ll end up burning in Hell for eternity. Of course you don’t want someone you’re close with to experience such a fate. Since the stakes are that high, she has to try playing 4D Chess and trying to slowly get him to her side. At times maybe she wasn’t perfect with her approach, but at least she kept on trying. I also liked the characters that Lee went to for advice. They all had an extremely confident air about them. Their smirks basically never left and while they weren’t downright condescending to Lee, they certainly seemed to think that he was asking extremely basic questions. Of course they likely weren’t in the best mood since he clearly was asking them questions to get them to take a shot at their religion so they were guarded. I just always like these kind of characters. You know that they’re not going to be on the defensive during the verbal exchange and have all of the answers. Overall, The Case For Christ is a pretty fun film. 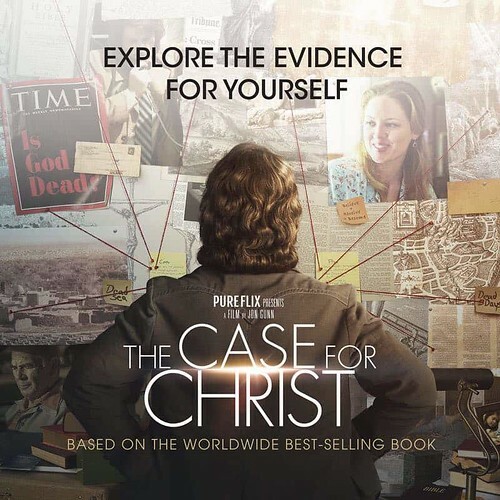 The writing is solid and the pacing for The Case for Christ is on point as well. I haven’t seen any debates in a while, but I always like seeing debaters challenge the two sides. I’m certainly not impartial as I’m a Christian, but all the more reasons to better understand the points that the opposition makes so I can know how best to respond. If you liked God’s Not Dead then I believe you’ll like this film. The main character is definitely annoying, but the rest of the case is solid. His coworkers are all pretty fun characters and the Nurse who saved the kid at the beginning isn’t bad. Maybe a little ineffective the whole time, but saving the kid is really all she needs on her resume. I’ll definitely be interested to see which film this company churns out next. I got to watch this film in theaters a while back, but it took a while to get around to it. 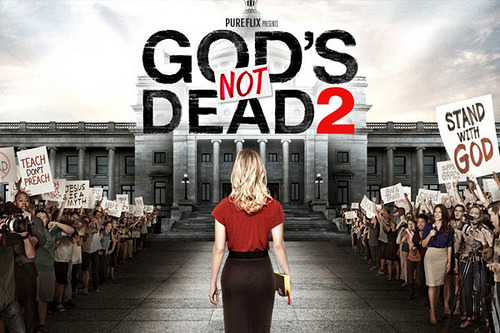 I really enjoyed God’s Not Dead so I was looking forward to the sequel. Debates with non believers on the validity of Christ is always very entertaining and I certainly recommend looking up some of the professional debates that are on Youtube. There are even Christian vs Christian debates online as they tackle the deeper topics like predetermination, and on whether parts of the Old Testament were parables. (I definitely disagree with the latter. At least on the Jonah and the Whale part. I think that definitely did in fact happen and it was not simply a story) God’s Not Dead 2 ups the stakes as the debate is in an official court room this time. Grace is a history teacher and one day she gets asked a question about whether King Jr., Ghandi, and Jesus Christ had similar messages of peace. Grace responds with a sound yes, but one kid in the back quickly sends a text to his parents. They quickly take it up to the Principal and they are ready to take Grace down if she does not retract her statement. Grace definitely does not and she quickly gets assigned one of the worst lawyers that they could find. Little do they know that Tom is very enthusiastic and doesn’t like to lose. He may not be at a high rank yet, but he’ll still give this his all. The two of them prepare for the big day in court as they fight to protect the right to use the Bible in historical context while at school. The one iffy thing about the first film was that it tried to juggle about 10 or more subplots. This one cuts down on that considerably so we can now focus on Grace’s subplot. The pastors from the first film also get a small role here as they show up every now and again, but don’t ultimately do much. It’s more for cameo purposes and to acknowledge the continuity of it all. The villains of this film are likable as antagonists. We have the principal who is very excited for this case since it is apparently something that he has been waiting for. He really gets into the battle as he even goes to the home of the student who asked the question and convinces her parents to stand against Grace. They quickly do since they don’t talk to Brooke as much as they should and don’t really understand that this is completely against her wishes. Brooke is a good character as well. She is struggling with death in her family and this is how she ends up becoming a Christian. The society makes this task very difficult for her though as peer pressure tries to get her to think that this may not be a good thing. After all, her teacher was brought to court and could lose everything just for mentioning the Bible in class and quoting a line or two. That’s a pretty steep price and it will only get steeper as time goes on. Brooke stands strong though and tries to provide Grace with support as best as she can. It doesn’t always pay off, but she does her best. Tom’s a solid character as well. His final plan was definitely super risky, but it shows what a good guy he is. He may not be a Christian, but he did still want to genuinely help Grace. His plan’s risk was mostly all directed at himself so even if it failed, Grace would be okay. Naturally, Grace is an excellent character. She is given many reasons to quickly take back what she has said and then everything would go away. Everyone advises her to do this, but Grace is courageous and managed to stay strong. It’s certainly a lot tougher than it looks to stand up to adversity without bending to the whims of the world, but it is what you have to do. Your faith will definitely be tested in one way or another during your life. Everyone faces trials and tribulations at some point and if you’ve never experienced one before, then you likely have one coming up. Even for those of us who have already gone through many struggles, there will always be new ones over the horizon. Life wasn’t meant to be easy, but it is all worth it for the final prize of Heaven in the end. One important thing to take away from debates is that you must be completely confident in yourself. You certainly do want to convince your opponent to become a Christian or to at least consider the possibility that God is real. However, another aspect is just as important and that is to not let your opponent shake you. They will try every tactic possible to convince you that Christianity is false as they point out moments that they deem hypocritical or implausible. The Devil would like nothing more than for you to enter a lot of Christian debates and slowly start to lose your faith in the Word’s infallible truths. It’s why debates aren’t always for everyone and I certainly don’t recommend looking into them any deeper than you are comfortable with. Give yourself time to read the Bible cover to cover on your own and listen to some sermons. Once you have a very clear understanding of it, then you can enjoy the debates. Otherwise, it’s possible that they will try to confuse you and twist the meanings of the Bible. It’s very easy to change the entire context of a passage by starting in the middle or ending a quote before it was really over. In the end, you don’t want anything to shake your faith. There are many things about the Bible that I don’t understand and many things that I probably can’t even if I were to focus on them forever. You can run yourself through logical loops forever and ever without getting any closer to the true meaning. The Bible isn’t meant to be comprehended in a quick sitting like an average novel. It’s known as the Living Word and that’s because you can always get something else out of it. You may interpret a passage one way the first time you read it and another way the next. You are constantly changing as a Christian and your capacity to understand will always be growing. It’s still hard to actually picture Heaven in all of its splendor and I do think that it is beyond comprehension. It’s something that you will simply have to look forward to experiencing and I can’t wait. “I would rather stand with God and be judged by the world, than stand with the world and be judged by God.” A solid quote to remember from Grace in this film. This world has a lot of joys and wonders in it as well to counteract all of the evil deeds around the world, but the thought of a perfect world of only joy is incredible. This one won’t last and the people who try to get you to renounce your faith won’t get the last laugh. Not only does God provide an end goal to look forward too, but he gives meaning to life. What would the whole point of our daily struggles be if we simply died in the end? With nothing to look forward too, then we would simply be living for day to day pleasures and that just doesn’t seem right. You always get the feeling that there has to be something more to life and Christianity gives you that something. It’s been great to see more and more Christian films arriving in theaters and I’m proud to support them. Hopefully these films will reach a lot of people and turn their hearts to Christ. Every soul saved is worthy of our celebration because it means that we will have saved another person from Hell. If you haven’t seen this film yet then I completely recommend it, along with its predecessor. God Is Not Dead was a terrific film and it’s good to see more and more Christian films make it to theaters. As more and more people hear about the Word, hopefully we will see them accept Christ into their lives. When I saw the title of this film, I immediately thought of a song that has been sung in Church fairly often as of late. It’s a great song based on the Apostle’s Creed where you reaffirm your faith in God. This film shows us many different characters who will have to deal with their faith in different ways as hardship comes in many forms. There are a number of plots here and they are all rather separate until a highway situation forces all of them to meet up and help each other out. A pastor is asked if he believes in the Cross and is unable to really answer at first. It is certainly a powerful symbol which has been interpreted in many ways. Sacrifice and kindness would be the first two words that I would use for it and other Christians would possibly have different views. We all know that Jesus died for us and how we respond to that is all different. The pastor asks everyone what the cross means to them. He is then faced with other tough choices like whether he should accept stolen money from a gang member or not. Naturally, accepting such an offer is certainly not something that a Christian wants to do, but not accepting it would possibly put the criminal in even more danger as the guy wants to walk away from crime. The best thing that the Pastor could have done in my opinion, would have been to hand the cops the money immediately. I suppose that they may have forced him to identify the guy who gave the package to him, but it still seems like the best case scenario for the guy. Not all of the plots end up perfectly happy for the characters, but most of them end up seeing the light and becoming a Christian before it’s too late. I think that the gangster plot was probably a little out of place here, but it did add some action to the whole ordeal, which is probably what the writers were going for here. One of the plots saw an emergency worker get sued for supposedly trying to convert someone to being a Christian and letting the guy die as a result. Naturally, this was not the case as the man tried his best to save the victim before converting him, but the wife would not hear of it. The man refused to lie about this even though it meant that he would lose all of his money in court as well as his job. Certainly a tough decision for anyone to make considering that your life would effectively be over as it would be very tough to bounce back from that. He certainly gave us a good example of standing by the belief that God will ensure that everything turns out okay. You have to believe and have faith. Some of the plots were certainly more enjoyable than others, but in a film with so many storylines, it makes sense that this would happen. None of the plots were bad though. For example, I didn’t care too much for the Pastor’s subplot where he took in a girl who was pregnant and having a tough time so he took her in. It’s not my kind of plot, but it definitely shows how selfless the Pastor was here. An old couple also took in a girl and her mother, who didn’t have a home before then. They were fortunate to meet up with these Christians and one also gave them a place to stay before that. Seeing such generosity is always inspiring. 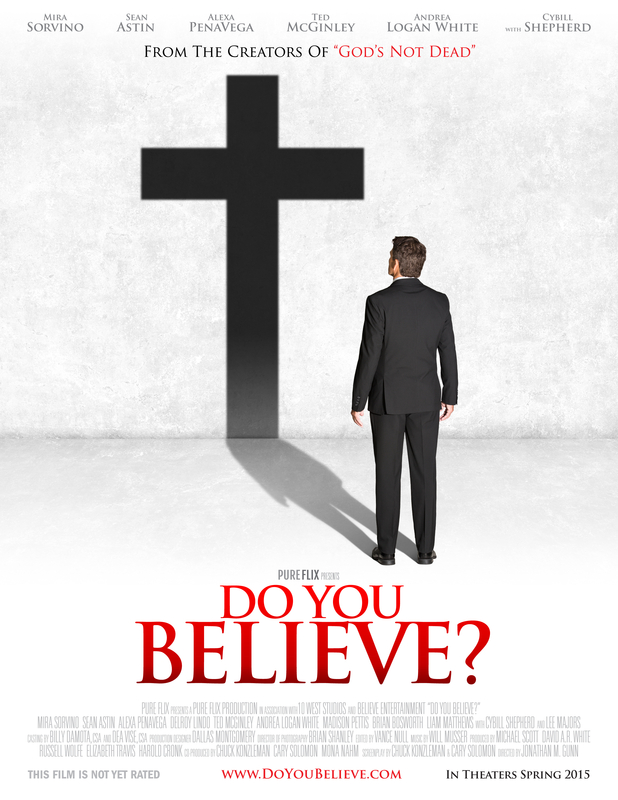 Do You Believe is a more somber than God’s Not Dead and shows you a lot of real trials that Christians deal with all the time. As such, the other film is naturally a lot more fun for me, but both titles are good to check out. As Christians, it’s good to give these films support provided that they do a good job of presenting God’s truths and aren’t simply trying to capitalize on them. This film has a number of good messages and I definitely recommend checking it out. At 2 hours, the movie is certainly able to fit a whole lot of themes in. If I had pick which trial was the toughest, it would probably be taking in the pregnant lady. You have to be really selfless to do such an act since letting someone into your home is no small feat. It will also be expensive since you will have to provide for another person. The easiest one would probably be the court case. Not saying that it is easy by any means, but at that point in the game, your honor as a person would also help you to stick to your story of what happened. Pride and honor wouldn’t let you back down and since you know that telling the truth is the right thing to do here, it’s a double incentive for you. The gangster one depends on if you’ve made your peace with the world or not. At the very least, the end should be fairly quick in that scenario. I was glad that the film didn’t go over the top with the sadness angle though as a certain individual staying in the car at the end would have been unfortunate. I look forward to seeing which Christian film I check out next. I know that several more will be coming out in the near future and that’s a really good thing. Despite society drifting further and further away from the Bible, these films give people a chance to retink Christianity and every person that ultimately converts into Christian is a big battle that has been won by the people behind the film. As in the film, there will always be those who will refuse to accept God even if a miracle occurs right in front of them, but we must still pray for as many people as possible to see the truth. Miracles do occur each and every day after all and until the Lord comes again, our mission to bring more and more people to Christ is not over! 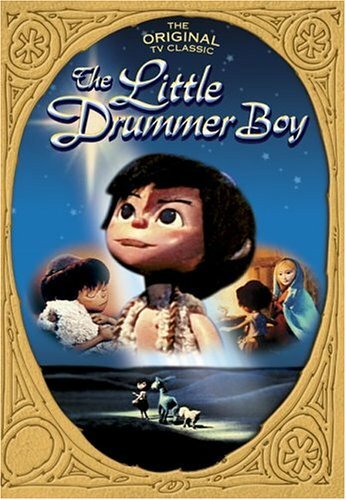 The Little Drummer Boy is a short from the 1960’s so it’s pretty old by today’s standards. Luckily, we know that old films can be pretty great (Godzilla, Several Hitchcock films, Superman, etc) and this one gives us a good message to take home for Christmas. Now’s the time to watch this one and it’s a pretty emotional story with some good themes inside. A little kid begins to hate all humans when his parents are destroyed in a sudden attack by bandits or a hostile nation. He escapes with three of the farm animals and his final gift from his parents..his drum. The animals can feel the love that eminates from the drum and the kid when he plays it and they begin to dance. Unfortunately, this attracts the wrong crowd and the little drummer boy is kidnapped given a deal. He will perform in front of three kings and then he will be set free with half of the money. The kid reluctantly agrees and he gets ready to perform. This title is only about 20-25 minutes so the plot is pretty continuous and hard to describe without spoiling other parts of the film so that’s as close as I can get to explaining it. One of the cool things about this film is that it’s a Christian Christmas film. It takes place during the birth of Jesus Christ and now you can probably guess who the three kings are. The film does a good job of developing the main story and then connecting it with the virgin birth. We only see Jesus for an instant at the end, but he is definitely portrayed flawlessly. His dominion over all is never in question and there had been a dicey scene earlier involving an animal injury, but let’s just say that it is taken care of. I was glad to see that since animal violence is the last thing that any of us want to see in this film or in any title for that matter. There is a small scene where a donkey doesn’t make it early on, but luckily they quickly take us away from that scene and it wasn’t a violent death by other wolves or something like that. The drummer boy is accompanied by two corrupt vagabonds for most of the film and they actually get a happy ending for themselves. We can assume that it probably didn’t last, but they are temporarily rich. Maybe they were nicer than they let on. They definitely knew how to earn money quickly, but it’s going to be difficult without the drummer boy’s magical music. The animation used seems to be a stop motion of sorts with figures. I naturally can’t say that it looks bad since this is the 60’s although I wouldn’t go as far as to say that it puts most current shows to shame. It works for the story and I wouldn’t call it a negative. The main character is the drummer boy and I will admit that he’s not the greatest of main characters. I still don’t really care for children playing the lead role in any film, but he is a nice individual and he learns a valuable lesson by the end. He just wants what’s best for his animals and he’s a nice friend to have. Overall, this is a pretty good story to watch on Christmas. It’s a pretty cheerful film by the end even if it is very somber during the beginning. Most importantly, it’s a Christmas film that reminds us of why we celebrate on December 25th. The birth of Christ is what started this festive day and we always need to keep in mind that this is the true reason for such a day. Obtaining presents and hanging out with the family are two very fun parts of Christmas, but the day is still about Christ first and foremost. Once again, I definitely recommend watching this title for Christmas. Merry Christmas everyone!